I can't believe you got back from NY, then turned out the fabulous hors d' oeuvres that you did last night! They were gobbled up as soon as you put them out! I didn't get a chance to thank you before you left, but please know that I do. It was fabulous! Thank you once again for helping us. I am loving my bread! It tastes so good. I had some last night, and sliced up the loaf and put it in the freezer. This morning I had a couple of slices as toast with breakfast. YUMMY! Sent my focacci to my son in Orlando at UCF to enjoy. Have you thought about doing a facebook page for Simple and Fresh? I think it would be great for you to do! 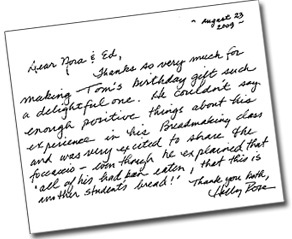 Dear Ed & Nora – just wanted to say once again what a great time we had at your class. Not only did we learn, but we had fun doing so. 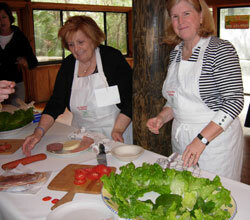 The “Italian ladies” were a hoot! I don’t know if you keep a mailing list for future events – but if so, please add our name to it. After getting home and organizing everything we realized we had not gotten a couple of the recipes: Bechemel sauce, Risotto w/Mushroom sauce, Florentine Steak– what did you coat the steak with? 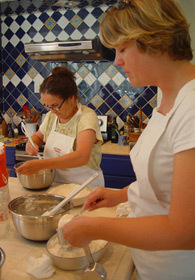 I just wanted to thank you for such a wonderful class on making bread. I had a great time and am looking forward to making bread for the rest of my life. You have made my husband a happy man!!! Anyway, looking forward to more classes with you. I had a bottle of wine to bring today and left it sitting on the counter here at the house. Sorry! I'll be sure to bring two bottles next time. Again, thank you so much for a wonderful session. P. S. The wine you made was very good. I have enjoyed reading the Simple & Fresh cookbook! The book is much more than a collection of Italian recipes. It introduces you into a family of emigrants that succeeded in perpetuating Italian rural customs. You feel that they loved each other, they liked staying and eating together. They became Americans but, at the same time, they remained Italians. Our cooking habits helped them enjoy life even when they were poor. The recipes are very clear and follow the good old rules. 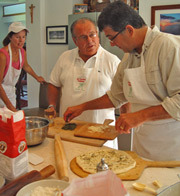 As Mr. E. Pankonin writes, his recipes bring the family together and testing and eating them adds flavour to daily life. “Simple and Fresh” is precious, it shows a sound, good enjoyable Italian way of life.